Look, I'm WAY Team America, totally glad I live here and have freedoms that while, YES could certainly use some work *COUGH COUGH UNIVERSAL HEALTH CASE AND FEDERALLY SANCTIONED GAY MARRIAGE COUUUUUUUUUUUUGH* are still pretty effing great. Trust me, there are worse places we could live in this world. I don't take that for granted. THAT SAID, I find red white and blue stuff kinda cheesy. It's one thing to see a child adorably dressed in a cotton ball beard and a 10-gallon hat with stars on it. It's another to see a full-grown, full-blown adult in an oversized flag tee and drawstring jersey shorts in red. 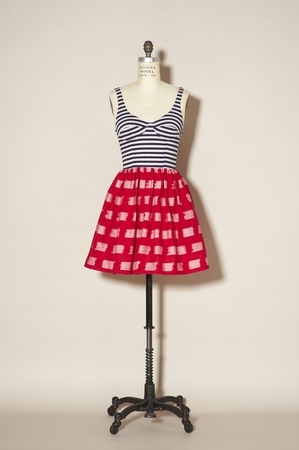 There are so many ways to do patriotic fashion in a cute, unscreaming way. Here are ten of them! 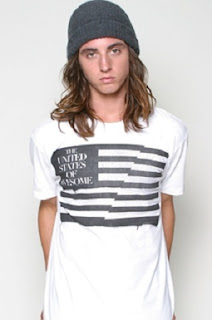 I love the idea of celebrating our nation's independence with stripes that AREN'T red, white, and/or blue and instead borrowing from the punk aesthetic of black and white stripes. A men's t-shirt that says "United States Of Awesome"? Cheesy? Yeah, sure. But so are bald eagles. True, florals aren't necessarily patriotic, but we have plenty of flowers here in America, right, so... why not? If you are going to red, white and blue, this is totally the way to do it -- mismatched but totally complementary patterns. And isn't that JUST an apt metaphor for the American melting pot? Mismatched yet adorable? Awwww. See what I did there? Again, this black Isabel Marant Rika blouse with tiny little baby white embroidered stars is an amazing take on otherwise cheese-coated stars and stripes. See? 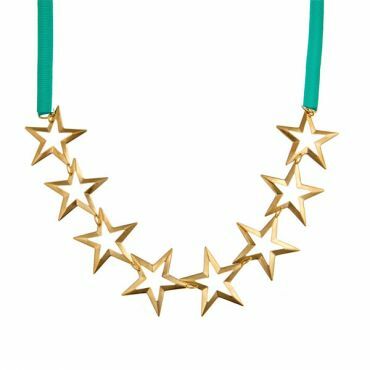 Stars for cool grownups! 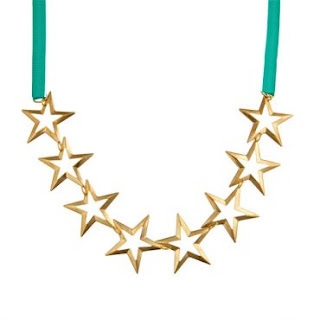 An olde-tymey star necklace on a grosgrain ribbon is kinda pretty perfect any day of the year. But you know... especially July 4th. And you can customize the ribbon color you want. I'm kinda into the beige. The Emily Elizabeth star ring is rull cute too. 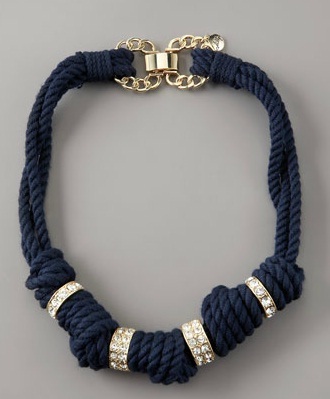 I love how '80s this navy and rhinestone knotted nautical Milly necklace is. I love with, say, a fitted black blazer, white tee and some cutoffs. Lands End generously sent me a cotton top, and seriously their basics are incredibly comfortable, versatile and well-priced. 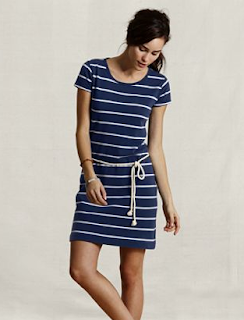 I don't own this striped rope-belted dress, but I'd wear it in a red hot and blue minute. Jeffrey Campbell is smoking crack. I mean that in the BEST way possible. It's like every week they roll out some new shoes that are five to seven times more batshit than the last ones. 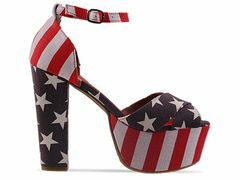 I wouldn't personally wear these Stars And Stripes El Carmen Maryjanes but only because I'd break an ankle. 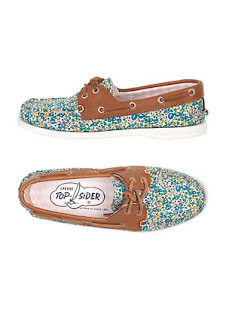 I own a pair of seashell-covered shoes, so tacky is clearly not an issue. 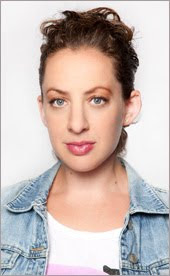 ... And SPEAKING of tacky, these are Violent Lips, which are lip tattoos. I was sent a few packs, and, thinking they were some kind of sticker, I barely read the instructions and haphazardly slapped them on. I think enough all day at work. I'm kind of "off the clock" as thinking goes when I get home at 10 o'clock at night. The point is, had I taken four seconds to READ the instructions, I would've known that these are like REAL temporary tattoos, and not stickers. They REALLY stay on. For up to eight hours. That's business time. Anyway, I slapped them on totally incorrectly, failing to read the part about WAITING FIVE MINUTES FOR THEM TO DRY. So, they were like, half smeared on, half hanging off, and pulling them off my lips was like pulling a Band-Aid off my lips... if that Band-Aid were made of DUCT TAPE! YEEEOWCH. Total drama over here in Brooklyn. Anyway, after a vigorous scrubbing with my toothbrush and scrubbing with makeup remover, (and removing the sticky bits from my TEETH) everything over here is back to normal. So, if you KNOW WHAT YOU'RE DOING and do it right -- because basically, I did EVERYTHING wrong -- Violent Lips are SUPER cool. Especially if you have around eight hours to wear lip tats somewhere. I neither knew what I was doing nor did it right. But, hey. This is America. We're still learning. The pants on the first picture looks cool! 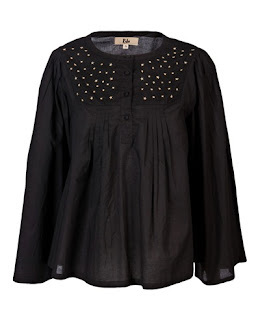 I love the Lands End dress, it's gorg! i love vertical stripped pants so much. 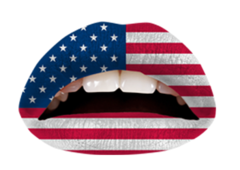 and i wish i could do my lips like that! american pride! Loving the striped pants. 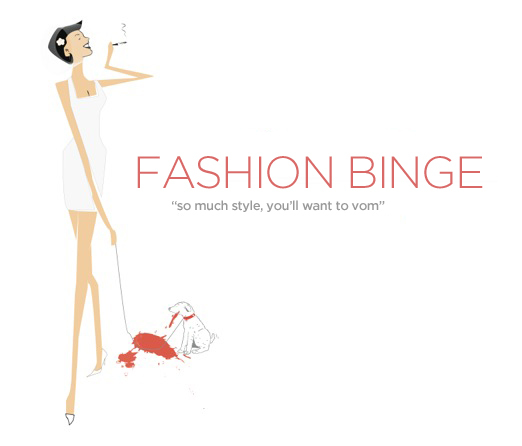 The style is perfect and vertical stripes are of course, slimming. Those Sperrys are REALLY cute! Are they waterproof like the leather ones?